Courtesy of Tattoo Archive: I recently came across an ad in The New York Times for prints from Edwards S. Curtis’ Native American photographs. Curtis is well-known for his images of the fading American Indian’s way of life. One of the images offered in this advertisement was for the Oglala Sioux Chief Jack Red Cloud (1862-1928). This got me to thinking about our Jack Redcloud, the tattooist who made his name tattooing in Brooklyn, New York. White-hat sailors getting tattooed by Jack Redcloud, 1940s. Bob Wicks tattooing Jack Redcloud’s head, 1920s. Jack Redcloud at work. Note shop sign in the background reading “Redcloud Jack’s”, 1930s. Eagle/shield design from Jack Redcloud’s shop, 1940s, Michael McCabe Collection. Red Cloud Brand citrus label, 1930s. Mermaid design from Jack Redcloud’s shop, 1940s, Michael McCabe Collection. Chief Jack Red Cloud was the son of Red Cloud, one of the fiercest enemies the US Army ever fought. Red Cloud led the successful Indian Campaign known as Red Cloud’s War between 1866-1868. 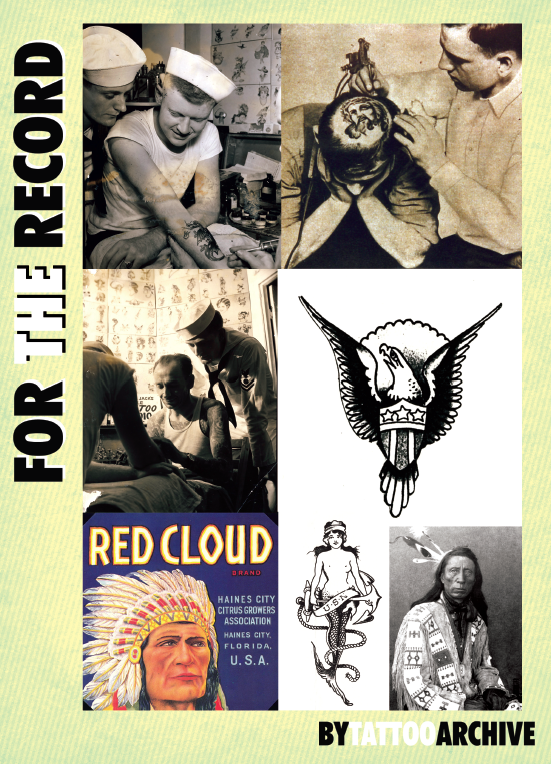 This installment of For the Record was featured in Tattoo Artist Magazine issue #16.